Home Roofing Why Invest in CertainTeed’s Integrity Roof System? The Integrity Roof System offers the full value of having a complete roofing system, which you can’t gain if you combine products from different brands. 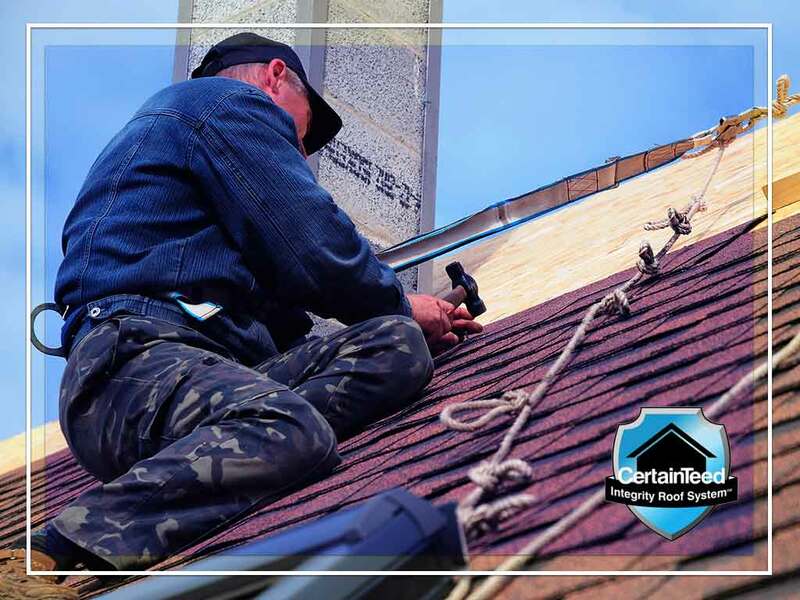 CertainTeed shingles are the main asset, but it also has starter shingles specifically designed to work in tandem with your chosen shingle product. It likewise features a layer of waterproof underlayment that envelopes the bare wood decking, protecting it from wind-driven rain and ice damming. Completing its uniform appearance and weather resistance are its hip and ridge caps, which complement the look of all CertainTeed shingles. They shield CertainTeed ridge vents from the elements, ensuring the Integrity Roof System has adequate attic ventilation year after year. For a home with flat-roofed sections, installing CertainTeed Flintlastic® roofing products can complement the performance of the Integrity Roof System. Other membranes can’t promise the same level of compatibility and performance. As a CertainTeed SELECT ShingleMaster™, Rogers Roofing can give you exclusive access to higher levels of SureStart™ coverage. Our SureStart PLUS™ Extended Warranty Protection guarantees added peace of mind, increasing the non-prorated protection period by up to 50 years. Beyond the 100% replacement roofing materials and labor coverage, upgrading to 5-Star coverage lets you enjoy a 25-year workmanship warranty. Plus, you’ll get reimbursed for tear-off and disposal costs incurred during repairs. Is CertainTeed’s Integrity Roof System right for you? Rogers Roofing will help you decide on the best replacement roofing system for your home. Call us at (773) 492-2270 or (219) 228-8210 now to talk about your home improvement needs, and get a FREE estimate. We serve Tinley Park, IL, and Northwest Indiana communities, such as Munster and Dyer.